We have a few tea roses that reward our benign neglect with spectacular blooms year after year, We manage a feeding or two, and an occasional deep soak along with the routine spray of the automatic lawn sprinklers. We have had wildly variable temperatures and lots of wind this spring. Including today. But our very first blooms deserve a note of appreciation even in their battered condition. They will never make a respectable calendar page. A little too sparse and ragged for that. But what joy those first soft petals of spring bring with them! Especially when you haven't been paying that much attention. The roses from this bush (of which I cannot tell you the name) have the most delicious spicy scent, and they are clearly just doing their job! In sunshine, rain, or windy days. So we do not demand perfection. Even for showing off. A David Austen Bride's Dream rose like this one looks flawless no matter what moment it chooses to unfurl. So thanks for indulging our humble little celebration of windswept roses! Prairie Blossom Market at Je L'Adore! Did you know that Rachel Ashwell has a new paint line? Prairie Blossom Market represents her beautiful line of colors at the little French vintage shop Je L'Adore! in Albuquerque. I have taken to calling the two talented sisters, Kathy and Sarah, the Prairie Girls. Here is their FB page, and here is Kathy's website and blog, White Swan Market, where she showcases her beautiful styling and photography. Love this chippy part of their gorgeously painted display! And rose botanicals are part of their wares in the shop. And here's a recent peek at the Cabin & Cottage side of things at Je L'Adore! for spring. I have my usual favorites on display. Look familiar? Life with linens is a beautiful thing. Come by if you are ever in town! Shop info is on my blog profile page here. The new guest house has a few built in storage areas. They seem so practical and space saving. But I couldn't wait to start arranging a few things to make the place homey. I want to keep everything light in the main room since it has few windows and tends to be dark. Silver is also great for reflecting light. I got lucky and found the plaster medallions at a local nursery. They are an unusual item for our location in the desert southwest. I was inspired by Brooke Giannetti's book "Patina Farm" and her use of plaster fragments in decorating which you can see much more of by clicking here.. This is all only a start of course. There will be endless tucking in and tweaking to come. I'm still considering that top shelf, for instance. I'd love to find the right sign or architectural fragment. A new find has landed here. For now, full of short glass church candles. A couple of reproduction jars with a French vibe. . . .
A bank of shuttered cupboards underneath. Empty for now. The long view to the kitchen is to the left. And more built in cupboards and shelves. The carved door lintel is original, and the old front door has just had a beautiful new finish restored. There is a great little courtyard just outside that begged for a bistro table. It's a fine spot for birdwatching and greeting the day. This property has no lawn and we plan to play up the Mediterranean style landscaping. If you missed the first peek click here. It's so nice that you came by for a look! Wishing you a terrific new week ahead! I caught this project just barely in time to give you a before picture. It was important because we (my sometime-painter husband and I) so rarely do projects like this and I wanted to be sure to post about it! I usually forget about the "before" until it's too late. This venerable old piece has a warped and chipping veneer on top, so it was fair game for a paint job. I used it mostly for display in my old shop, although it was also for sale. (You can see the original finish on the bottom drawer.) Nobody wanted it as it was, so it was tucked away in storage for awhile after the shop closed up. This is not Miss Mustard Seed or anyone else's fancy paint. It's wall paint. I can't even tell you the color. I just said to my willing partner, "I want to see brush strokes and a little of the old finish showing through." He did a great job! We painted hardware and all. French furniture seems more French to me with a painted finish. Voila! Anyway I needed this piece to be light for the big dark space it is going into. 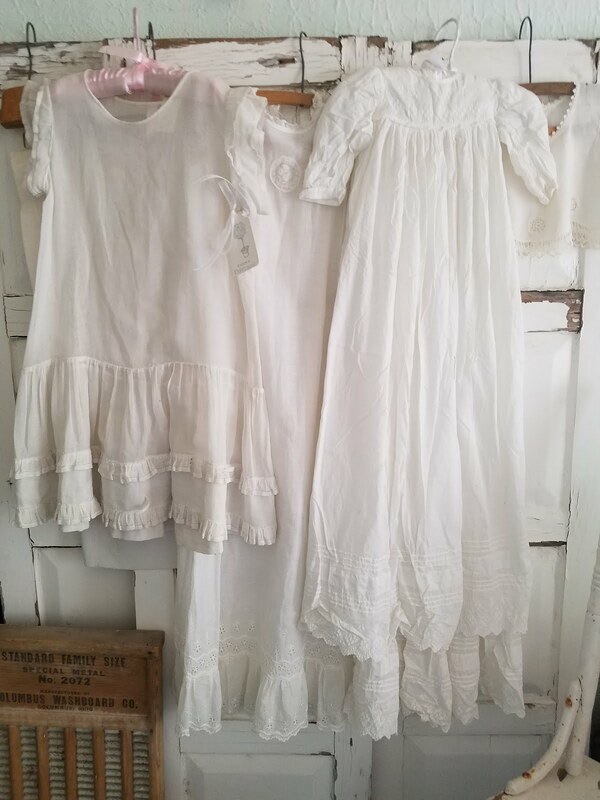 I have been gathering stuff that reminds me of an old French farmhouse for a hundred year old home that we are renting as a guest house two doors down in our old historic neighborhood where we live in the quiet river valley of Albuquerque. I have long dreamed of inhabiting old rooms like these, and am in the process of completing my mini vision. The salon is enormous, with long dark overhead beams. Part of the old structure was the original neighborhood schoolhouse. It has both brick and hardwood floors, and old adobe walls. The main room has one long wall on the west side with no windows. As both the beams and floor are dark, my job is to make the room as light-filled as possible. There are a lot of issues to work around. This wall has a long vertical conduit to nowhere behind those shutters. There is also an enormous old wall heater to conceal when not in use. And that is just the beginning. But I can't begin to describe the beautiful long sighs that old walls like this breathe in and out through its windows and doors. We are utterly infatuated with its aura and charm. We have barely begun, and there is a lot to do. Next time I will give you a peek at the built-in cuboards and shelves on the other side of the room.